COMMENTARY ON "THE DAY OF THE LORD"
Note: Unless otherwise stated, all biblical quotes are from the English Standard Version (ESV). This week’s lesson is a discussion as to why the reader is to remember and live for the second coming. 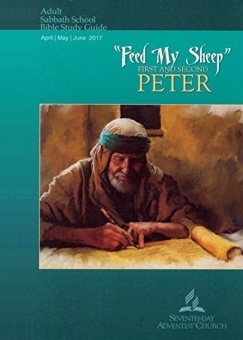 The underlying problem with this lesson is, again, that the author addresses the texts from 2 Peter with an Adventist perspective. This perspective misses the hope and reality of the passage Peter writes and reduces Peter’s warning to mere moralisms. Without being born again through trusting the finished work of the Lord Jesus alone, Peter’s letter can only be seen as calls to “shape up” and do the right thing. If one is born again, however, the reminder’s of God’s judgment have context. Furthermore, the lesson’s statements about people forgetting the urgency of the impending Coming because is seems so remote and unreal comes from the Adventist worldview. It is only a predicted event, like one’s birthday a decade away. One can know it’s supposed to come, but it can be ignored in the intervening time. When one knows the Lord Jesus, however, His return is not a theoretical event one can forget. Because we KNOW Him, because we are remembering His sacrifice and the new covenant every time we take communion—a remembrance which He commanded we do until He drinks the cup with us in the Kingdom, we always have Him on our minds. He is our life, our Lord, our foundation, our reality, and there is no possible way we can forget Him or the promised return. Furthermore, Jesus’ return is not a judgment for those who know Him, who have passed from death to life and do not come into condemnation or judgment (John 5:24). God’s judgment is only for those who are lost. Adventists, however, have no possible way to know whether or not they are saved because they believe their life’s records are being examined. Only at the resurrection will they know whether or not they have passed the investigative judgment. Additionally, the fact that Adventists do not believe they have spirits separate from their bodies means that they have no understanding of what it means that when one believes, he passes from death to life at that moment. Adventists do not understand that eternal life is a certainty and a security for those who believe, that God’s Spirit testifies with our spirits that we are children of God (Ro. 8:14-17). This question is shallow and filed with assumptions. If one uses simply the logic that Adventists keep Sabbath because of the Word of God, then one must ask, using the Adventist understanding of the Word of God, why don’t they keep the New Moon festivals? The Word of God is very clear about the new covenant. The holy days, monthly and yearly festivals are obsolete and fulfilled in the reality that is Christ (Col. 2:16-17). Hebrews 8 explains that the old covenant was flawed and is obsolete; the new covenant God promised in Jeremiah 31:31-33 has come! The holy days are fulfilled in Jesus. Romans, Ephesians, Colossians, Galatians, Hebrews are explicitly clear that the old covenant does not continue, nor does the law continue in any respect for the church. The entire levitical system depended upon the levitical priesthood. “When the priesthood is changed, of necessity there takes place a change of the law also” (Heb. 7:12). One cannot pick and choose which aspects of the Mosaic covenant one will keep and which one will jettison. The law is a unit; the entire old covenant served it purpose until the Seed came (Galatians 3). Now, the Lord Jesus is our Law; His Spirit indwells believers, and no command given to believers is applicable to unbelievers. Unbelievers who have not trusted Jesus alone and repented of their innate sinfulness cannot keep any of the commands of Scripture in a real way. Moralism is not the same as obedience to the Lord Jesus and His word. Moralism is empty and dead and counts for nothing. They are deeds as filthy as Paul’s which he describes in Philippians 3:8. He who believes in Him is not judged; he who does not believe has been judged already, because he has not believed in the name of the only begotten Son of God (Jn. 3:18). There is no law-keeping or spiritual observance we can do to prepare us for judgment. We must know that God’s word is true, that just as surely as God destroyed the world with a flood, He will destroy the world with fire at the end. We can know that if we have trusted Christ, we are ALREADY eternally alive and will never die, even if our bodies die (Jn. 5:24; 11:25-26). There is nothing besides trusting the Lord Jesus and His finished work of atonement accomplished through His death, burial, and resurrection that can prepare you for the second coming. Copyright 2017 BibleStudiesForAdventists.com. All rights reserved. Revised June 7, 2017. This website is published by Life Assurance Ministries, Camp Verde, Arizona, USA, the publisher of Proclamation! Magazine. Contact email: BibleStudiesForAdventists@gmail.com.